The basic cabinet building material is 5/8" thick MDF from Home Depot, which is where the contact cement, T-nuts, door latches, door handles, coin and back door hinges, and marquee light-box vent were also obtained. The T-molding and slotting cutter and arbor are from T-Molding.com. The I-Pac 4 is from Ultimarc. The spinners and USB interface board are from Groovy Game Gear. The buttons, button microswitches, joysticks, trackball, and coin doors and mechanisms are from Xgaming. The actual coin mechanisms behind the coin doors can be swapped out for whatever currency you wish; they're only attached with thumb-screws. The trackball mounting kit, audio amplifier, audio amplifier power supply, and speakers are from Suzo-Happ, who also sell coin mechanisms for many currencies. The audio amplifier is not sold with a knob, so a proper knob was obtained from Newark Element 14. The green, red, yellow, blue, and white hook-up wire, as well as quick connectors are from Newark Element 14. Note: you will see in the pictures that I used some blue quick connectors as well. This was a mistake, but they seemed secure enough so I left them. The correct size of connectors for 22 AWG wire is the red size. The two cabinet cooling fans are from Amazon.com. The cover plate for the cabinet cooling fans is from Amazon.com. I removed and tossed the fans that came with it. The side art and marquee are from Game On Grafix. The casters for the base and the control panel hinges are from Lee Valley Tools. The laminate for the top of the base and control panel is from Lowes. The Velcro Rip-Tie straps are from Infinite Cables. The bezel is made from 6 mm thick, tempered glass, bought from a local glass supplier. I masked with black spray paint all but the area through which the LCD monitor is visible. 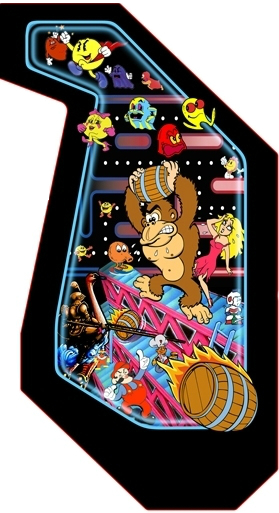 For the MAME front-end I chose to use MameWah because it's open-source. See details here. The dimensions of the side panels are provided here as a pdf file (95 kB) and as a Microsoft Visio drawing (19 kB). The inside dimension between left and right side panels is 26". Button Layout Pattern: I examined all the various layouts at Slag Coin and modified one to better fit my hand. I prepared Adobe Illustrator template drawings which I used to center-punch the positions onto the MDF control panel (see picture in gallery). Here are links to the left and right template files, and a pdf file with dimensions in cm if you don't have Adobe Illustrator. Please note that the layout was designed to accomodate the width of the buttons I bought (see parts list).